There are certain luxuries every mother looks forward to--grocery shopping (or any shopping) without the children, finally getting around to having a proper manicure, napping. 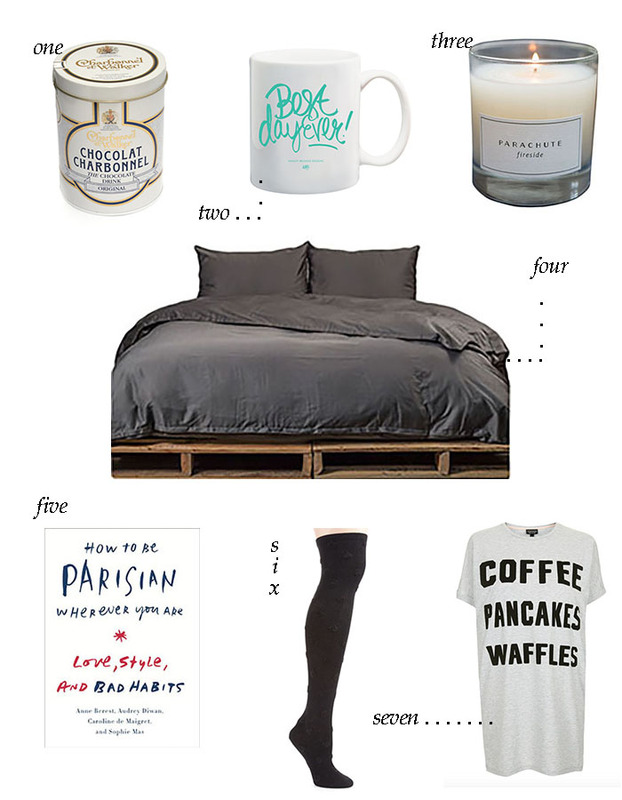 A cozy day spent at home in bed also tops the list, and since a certain famous groundhog saw his shadow recently, six more weeks of winter means there will be plenty of opportunities to get cozy and spend a deliciously lazy day indoors. Here is everything I need to enjoy a cushy day in bed. The cornerstone of a truly cozy day in bed is wonderfully soft and cushy bedding to laze around in. The Venice Set from Parachute Home is not only gorgeous, it's amazingly comfortable and feels so luxurious. I have an amazing homemade recipe (featured here), but if I'm feeling especially lazy a good mix does the trick nicely (plus my husband can make it for me and bring it to me in bed). And of course it has to be served in the perfect mug. For the perfect cozy day in, I ditch the ratty old sweatpants in favor of something cuter--usually a a comfy sleep tee and slouchy socks. This could also be a stack of magazines, a newspaper, --any reading material will do, as long as it's not in any way related to work. A candle adds so much to a relaxing day, from the soft, golden light it gives to the calming fragrance that lulls you in and out of sleep. The Fireside candle from Parachute Home is warm and inviting, like a crackling fire on a chilly day.